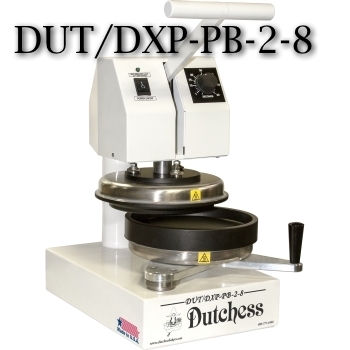 DUT/DXP-PB-2-8 Manual Dough Press -- Dutchess Bakers Machinery Co. Inc. The Model DUT/DXP-PB-2-8 manual Pizza Dough Press is the most efficient, durable and easy machine to Press, Form and Parbake personal size pizza dough. With 8" heated platens you can press 8" pizza shells with a rim in seconds to a light crispy brown. Press straight from the refrigerator. The lightweight bottom platen swings out to allow quick loading and unloading of product. Par-bakes shells hold for hours refrigerated or can be frozen for longer shelf life. Xylan coated upper & lower platens. Heated upper and lower platens pre-set to 430°F, (221°C). Electronic timer - Variable from 0-60 seconds. Bottom platen swings out for easy dough removal. Heat indicating pilot light turns off when temperature is reached. 208-240v/50-60hz/1ph, 2800 watts, 11.7 amps. Compact size fits almost anywhere. ETL Certified to UL standards. Par-bake Pizza dough in 45-60 seconds. From 75 up to 150 pizza skins per hour. 60 or more par-baked crusts per hour. Safe - No minimum age requirements.